Julia and I are constantly travelling, so we’ve teamed up with Visa to bring you our essential travel tips so you’re prepared for your next trip to our favourite destination, Bali! We want you making the most out of your trip to Bali, and explore outside of the usual tourist landmarks – so follow these simple steps for an enjoyable, stress free trip as a traveller and #NotATourist. Be early When travelling long haul, I try to make sure I arrive at the airport as organised as possible. Pack a few days in advance and have all electronic devices fully charged, as there’s nothing worse than having to find a wall plug at the airport to charge an ipad or mobile. Research what will be the most cost effective way to travel to and from the airport and book transport two days prior. Or if you’re driving, pre-book your parking. Always arrive early – you’ll avoid queues, and can check in earlier, which means you may be able to pick where you want to sit! Know what to wear Flying can be uncomfortable if you are not dressed in appropriate clothing. Loose fitting clothing is always the best option - trying to curl up in skinny jeans and a tight fitting top is not ideal! Don’t forget to layer your clothing and wear flat shoes that have some room in them in case your feet swell during the flight. Compression stockings or socks will help prevent swelling of the legs and feet and help guard against Deep Vein Thrombosis (DVT). When visiting temples in Bali, both men and women are expected to wear shirts and cover shoulders and the upper arms. You’ll need to cover your legs too - most temples have sarongs and scarves you can hire if you aren’t wearing proper attire. Currency When travelling to Bali I always make sure I exchange some of my money into Indonesian Rupiah for arrival. There are money changers and ATMs everywhere so if you do run out of cash it is easily accessible to exchange more. I’m always cautious about carrying a large amount of cash around with me so I’m usually armed with my Visa debit card which can take care of meals, shopping, accommodation and activities too. When arriving in Bali you will need to purchase a 30 day travel visa which costs approx. $35 US dollars, and you’ll need to pay that when you leave too. Don’t be caught out – be prepared. 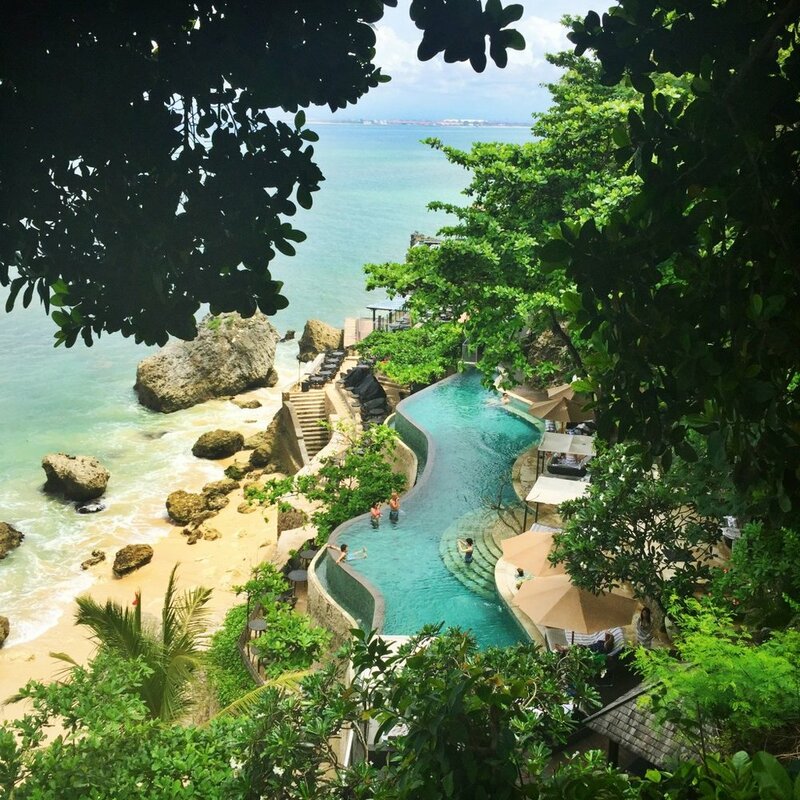 Where to stay Before booking my first trip to Bali I did a lot of research on different accommodation options. I love www.balibible.com which can also be downloaded as an app – very helpful. This really is a bible of everything you need to know about Bali so you can travel like you know the place - everything from accommodation, restaurants, coffee spots, beaches and the best shopping places. I booked all my accommodation through balibible.com and also luxenomad.com, which is a website that has loads of deals for villas and hotels throughout Bali. I would highly recommend Villa Camilla and East Residence in Canggu, Ayana Resort in Jimbaran and Hu’u villas in Seminyak. 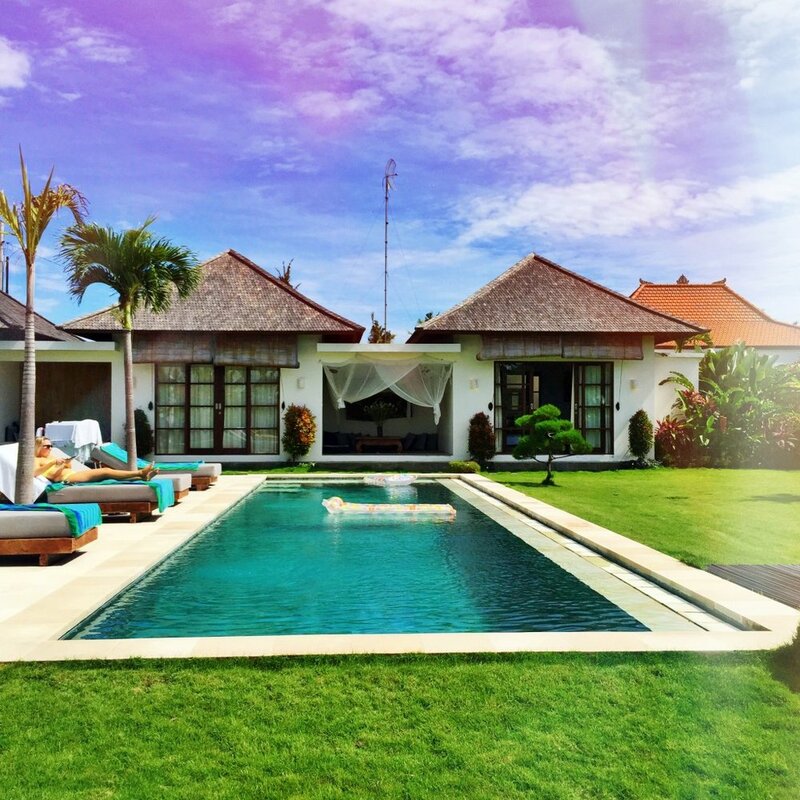 The great thing about Bali is that you can hire a beautiful private villa for as little as $100 a night! Before booking, always check the reviews on TripAdvisor (as official hotel websites can sometimes be deceiving). Choose the location of your accommodation wisely and consider proximity to local dining options, or your preference on shopping hotspots or activities, also consider staying close to transport if needed. Staying healthy While you’re in Bali, it pays to be mindful about what you’re drinking and eating. ‘Bali Belly’ is the last thing you want to be dealing with when exploring and it’s often caused by drinking tap water. So, stick to drinking bottled water, and drink plenty of it to avoid dehydration, (this includes brushing your teeth with bottled water). Drink between 2-3 litres a day. Coconut water is also great to sip on as it’s full of electrolytes, and a staple in the Balinese diet. Make sure you’re washing your hands regularly and pack hand sanitiser to eliminate any bacteria that is going to cause you to get sick. Most hotels and villas will be able to provide contact details for doctors if you do get sick but do your research on the closest hospital to where you are staying. After all, being on an overseas adventure should be enjoyable and relaxing, so being prepared is going to make your trip a lot more stress free!! What to see & do Bali is one of the most beautiful destinations I have visited. A trip here can be filled with amazing food, culture, art, nature and also great night life. 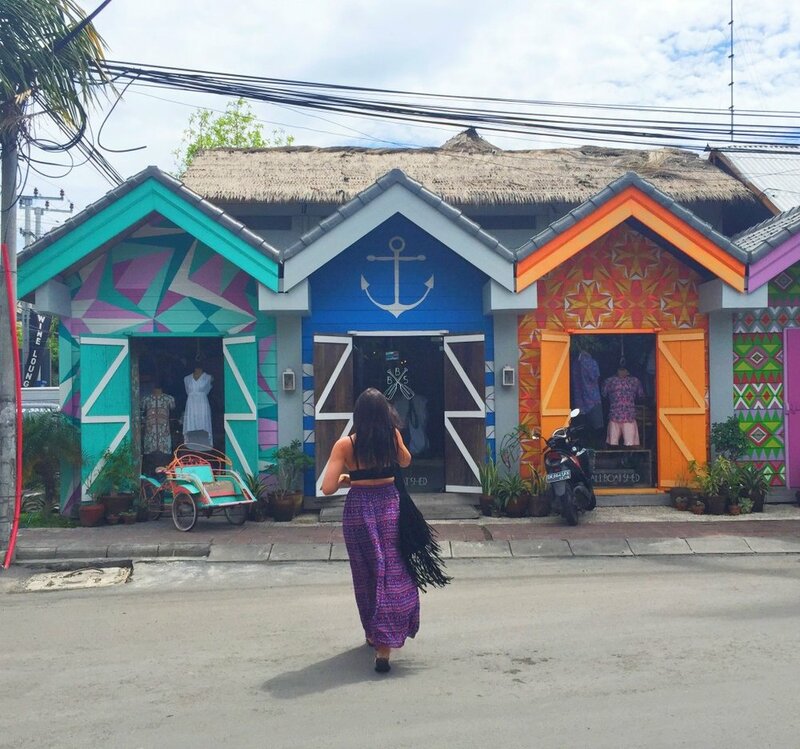 If staying in Seminyak, visit the markets that run throughout the town. You can pick up some super cheap homewares, jewellery, clothing and other items. You cannot visit Bali without visiting a temple! My top three are Uluwatu Temple, Tanah Lot and Lempuyang Temple. Each temple is unique and they all overlook breathtaking views. Bali is also known for amazing yoga and meditation retreats, so if you are into either of these, try out a class for a truly spiritual experience. Don’t miss the Ubud Sacred Monkey Forest, it is a nature reserve and temple complex which houses approximately 340 monkeys. These monkeys are nothing like the innocent looking monkeys on the brochures so hold on tightly to your cameras and bags! No guided tour is necessary, but make sure you pick up bananas (locals sell these in street-side stalls) to really get up close and personal with the monkeys. Got any good tips for us? Share your Bali travel tips in the comments below.